Beginning with its founding in 1893, American University has been notable for the women who have walked its halls - women like suffragist Alice Stokes Paul and Washington College of Law founders Ellen Spencer Mussey and Emma Gillett. There was no better way to celebrate Founders Week and Women’s History Month than to bring back some remarkable alumnae who have been instrumental in creating change at different intersections of society and the university. Entrepreneur KaDeadra McNealy, SPA/MPAP ’18, successfully launched her business, Millennial Nail Bar (MNB) in 2018. Inspired by the support she received as a student from the AU Entrepreneurship Incubator, KaDeadra felt motivated to host an event with the goal of bringing students and alumnae together to share entrepreneurial journeys, success stories, struggles, advice, and resources. 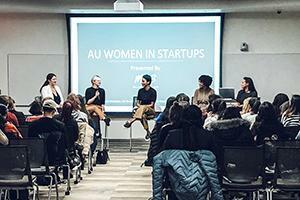 Alumnae who have founded businesses were a perfect addition to the on-campus event lineup during AU’s 126th Founders Week. As Founders Week and the Founders Day Giving Challenge continue to unite campus and the AU community, the Alumni Association hopes to continue to bring back more alumni founders to share their stories! AU Women’s Network celebrated extraordinary women at the Sixth sixth Annual annual Alumni in the Know: Women in Leadership Panel. For 2019, the co-chairs, Lori George Billingsley, SOC/MA ’91, and Penny Pagano, CAS/BA ’65, chose the theme – “Women Who Mean Business: Securing Our Seat at the Table” to acknowledge the importance of diversifying corporate structures and the challenges of getting to the top. President Burwell reiterated AU’s history of producing leaders, highlighting Professor Laura DeNardis’s research on digital governance and Professor Katie DeCicco-Skinner’s exploration of ways to fight cancer. • Connie Sharpe Ruohomaki, SOC/MA ’00, a strategist at SharpeStrategies, a communications firm that frequently works with urban and rural governments on policy. The shared advice the panelists shared was to speak up! Each of them emphasized identifying mentors, especially to rely on in moments of self-doubt. Students and alumni who attended the event described it as an exhilarating experience.